This awesome Disney McQueen 4-in-1 Ride On is currently 50% off at Target making it only $34.98 (regularly $69.99)! Plus, use your Target Red Card to save even more paying only $33.23 and receiving FREE Shipping! This is definitely a ride on toy that can grow with your little guy or girl. It starts out as a rocker with a safety seat and a handle and can convert all the way to a ride on toy as they grow! Plus, the lights and sounds from buttons on the steering wheel, gas, and brake pedals make this all the more exciting! 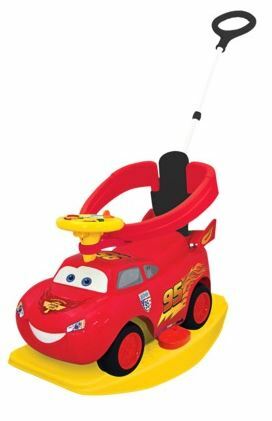 The same product is currently selling at Toys R Us for it's full price of $69.99 so don't miss this price if you have a little one who loves Lightning McQueen!